Looking for a car with a unique personality and a fresh attitude? Say hello to the new Citroën C3 Aircross. Winner of the ‘Best Small SUV’ in the 2018 CarBuyer Best Car Awards, the new C3 Aircross was praised for its unique personality, versatility and class-leading boot space. Grip control with hill descent assist allows you to take on any terrain. Modify the degree of traction to the terrain and control your speed when driving downhill – even on a steep slope. Park assist technology makes city centre parking a breeze, and the 7-inch touchscreen displays a full 180-degree view of the area behind the vehicle when reversing. Inside, the Citroën C3 Aircross provides all the interior space and comfort you could ever need. Five seats offer generous leg and head room, and there’s a 410-litre boot to stow your shopping. And with its stunning panoramic sliding glass roof, it’s a lighter, brighter way to drive. 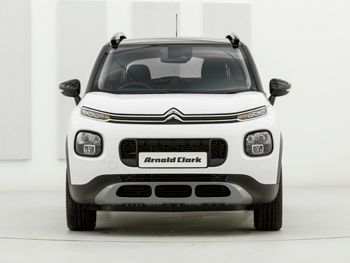 With eight body colours and three roof colours, the C3 Aircross can be configured to suit the boldest of personalities.